We are at the halfway point! How are you doing? Able to write a poem every day or every other day? If you are just joining the NaPoWriMo – welcome. Reminders- Helping me again this year with prompts is Brendan McBreen a member of the Striped Water Poets group in Auburn Washington I am quite overwhelmed with the work of running a brand new independent new and gently used bookstore in Kirkland, Washington (609 Market St.) called BookTree. So, thankfully Brendan sent over lots of suggestions. Brendan’s website is here. BookTree on Facebook (Please LIKE and Follow the page). If you are in the Kirkland/Seattle/Western Washington area, there are several events of interest occurring at the bookstore. On April 15th, Robert Lashley will be leading a free workshop and later in the evening reading some poems from his newest collection Up South. We’ll also have an open mic. Third Saturday PoetryIsEverything at BookTree. Erasure. Take a magazine article, essay or text of more than 1500 words (yes you can use a few pages from a book) and eliminate words, leaving behind your poem. You’ll want to transform the text into something completely different than what it is by doing this. You can fudge just a little bit by adding a few modifiers and connecting words if absolutely needed (the, and) but keep the words in the order they would be in the article. We aren’t rearranging the words, or borrowing words and phrases to reassemble into a (cut-out) poem (William Burroughs style)…we are creating an erasure poem. Some always ask… is this really a thing? A way people ‘write’ poetry? It is indeed… and it does take patience, skill and some craft to do it very well. You can create a meter or even rhyme if you want… though don’t be tempted to change word order around…. (if you need to change a tense…add an ‘ed’ or ‘s’…I think that’s okay… some don’t… so it’s up to you). Have at it NaPoWriMo-ers…..
Brendan suggested using 6 names of fish in a political poem for Prompt 13. I had less than 20 minutes to write something… used 9 fish names. The Harelip sucker, Hatchetfish, and Humuhumunukunukuapua’a shrugged. *The marbled grouper (Dermatolepis inermis) is a species of fish in the family Serranidae. Other common names include donkey fish, mutton hamlet, rockhind, and sicklefish grouper. but a blessing to experience. And so it goes. Co-owning BookTree in Kirkland has monopolized my time the last several months and made even more demands than I imagined. I have begun the Third Saturday Poetry is Everything workshop and poetry reading however. We have quite the line-up scheduled in the coming months. BookTree also has a BookTree Facebook Page. 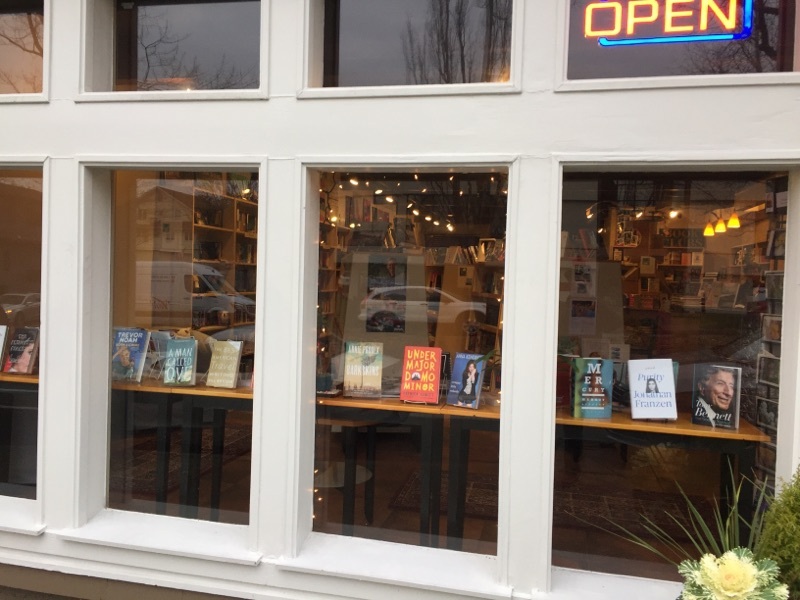 It would be great if you could like/share and follow the page and help get the word out, that there is an independent new and used general bookstore in Kirkland (one of the few remaining on the eastside by the way). I do have a couple of readings coming up (April and beyond), I am going to finish editing BANG! and it will be in print (and as an e-book) in September or October. Soon it will be April and NapoWriMo time! and poetry is painting that speaks. Many of you know that I am now the co-owner/ manager of a new independent new and used bookstore, BookTree located at 609 Market Street in Kirkland, Wa 98033. We had our Grand Opening on November 5th. It has been an overwhelming, and rewarding journey creating a new bookstore for Kirkland. A few Sunday’s ago the Seattle Times featured our store! We’ve had several author events, a holiday party and the beginning of our brand new workshop/reading/open mic series. The co-feature is Michael Schein! (he has plans to re-locate in the near future so it may be a while before you get a chance to see and hear him). Michael Dylan Welch has had his haiku performed for the Empress of Japan and at the Baseball Hall of Fame. In 2012, one of his translations from the Japanese appeared on the back of 150,000,000 U.S. postage stamps. He was keynote speaker for the 2013 Haiku International Association convention in Tokyo, and has published his haiku, tanka, longer poetry, essays, and reviews in hundreds of journals in twenty languages, including Rattle, Kyoto Journal, Raven Chronicles, StringTown, Bacopa, The Writer’s Chronicle, Writer’s Digest, Clover, and many others, the latter of which just nominated him for a Pushcart Prize. He cofounded the Haiku North America conference in 1991 and the American Haiku Archives in 1996, and founded the Tanka Society of America in 2000 and National Haiku Writing Month in 2010. He served two terms as Redmond’s poet laureate, and in 2010 was selected for the Jack Straw Writers program. His most recent books are Seven Suns / Seven Moons (with Tanya McDonald; NeoPoiesis Press), Off the Beaten Track: A Year in Haiku (Boatwhistle Books), Fire in the Treetops: Celebrating Twenty-Five Years of Haiku North America, and Becoming a Haiku Poet (both Press Here). Co-Feature Poet – Michael Schein is the author of the nonfiction history, John Surratt: the Lincoln Assassin Who Got Away (September 1, 2015), as well as two acclaimed historical novels, Bones Beneath Our Feet (2011) and Just Deceits (2008). Mr. Schein taught American Legal History at Seattle University Law School from 1988-2003, served on the speakers’ bureau of Humanities Washington, and is Director of LiTFUSE Poets’ Workshop. His poetry is supported by a grant from King County 4Culture, and has been nominated three times for the Pushcart Prize. Born and raised in Vermont, Mr. Schein attended Reed College in Portland, University of Oregon Law School in Eugene, and now lives near Seattle.He is a former professor of American Legal History. Bring a Poem or very very short piece of prose if you would like and sign up on our list to read for between 3 and 4 minutes. As I have time I will update this blog with other readings and events of interest! Sleeps Poetry Challenge are underway. Doors open at 6:30; open mic starts at 7. Featured reader at 7:30.
even song, along with a friend to hear you at the mic! ROY R SEITZ is a poet with no initials behind his name. humble do when driven insane. Hearing his work is mandatory in his mind. Note- One Week Earlier than norm. Thursday, August 8, 2013, 7:00 p.m.
Elizabeth Myhr, a founding member of Calypso Editions (www.calypsoeditions.org), is a poet, editor, and publisher. Calypso is a collective, virtual press with a global perspective whose mission is to bring poetry into translation for the American creative bloodstream. Myhr based Calypso on excellence in book design, translations, and emerging authors for English audiences. Calypso has published poetry and short fiction in English, Russian, Polish, and Romanian, including works by Tolstoy and Anna Swir. Books& Culture listed Myhr’s first book, the vanishings (Calypso), as one of its three top poetry books of 2011. Myhr lives in Seattle with her family. Christopher J. Jarmick has been organizing readings throughout the Puget Sound for more than twelve years. His latest book of poetry is Ignition: Poem Starters, Septolets, Statements and Double Dog Dares (2010) He also recorded the spoken-word CD Radio Pictures: Aural Anxieties (2009) with Michael C. Ford. His poems, articles, interviews, and book reviews have appeared in Many Trails to the Summit (Rose Alley Press), Rattle, Ravens Chronicles, and online. A former Los Angeles television producer with credits that include award-winning PBS documentaries and segments for Entertainment Tonight, Hard Copy, and other programs, Chris moved to Seattle in 1994, and now lives in Kenmore, Washington. Join us for an unprecedented evening of music on the waterfront. Recognized as one of Canada’s premiere pianists, Robert Silverman has reached a level of musical and technical authority rarely accomplished. He has performed in concert halls throughout North America, Europe, the Far East and Australia and has appeared with orchestras on three continents, including the Chicago Symphony, the Sydney Symphony, the BBC (London) Symphony and the St. Petersburg Philharmonic Orchestra. Sunday August 11th — Auburn, WA. to the Auburn Days Festival is THIS Weekend! in the air-conditioned Auburn Avenue Theater! Book Fair Small Press Fair local publishers and authors! take a book trade a book! 9 – 12: Free Poetry Workshop: Ready Set Submit! Want to kick your submissions up a notch? Not sure how to track and record the details? Want to know more about electronic journals, online submissions and ways to look like a pro? This workshop is for those unfamiliar with electronic submissions & tracking, as well as those who have some knowledge but want to know more. This workshop provides writing exercises and information on submission tracking, writing resources and hints on how to avoid mistakes that publishers hate. (use Yahoo or Google Maps too). The Auburn Avenue Theater is located at: 10 Auburn Ave. Auburn, WA 98002, the Auburn Transit Center is at: 110 2nd St SW, Auburn, WA 98001, the same as the Station Bistro. For parking, the Auburn Station (Auburn Transit Center) has a small parking garage. Across the street from the Station Bistro is a gravel lot that should be available too. Across the street from the Auburn Avenue Theater is a Key Bank, we usually use their parking lot for loading and unloading. We do not have permission to park there, however it will be Sunday and they will be closed and we have used that lot in the past without any problems. The back driveway on 1st street NE will be open. Take I-5 South, take exit 142A, heading East on Hwy 18.
follow Auburn Way N. and you will see festival signs! Take I-5 North, take exit number 142, heading East on Hwy 18! Take HWY 167 heading South, take the 15th Street Exit, at stop light, turn left onto 15th Street; continue until Auburn Way N., turn Right onto Auburn Way N. and follow this road until you see festival signs! Take HWY 167 heading North, take the 15th Street Exit, at stop light, turn right onto 15th Street; continue until Auburn Way N., turn Right onto Auburn Way N. and follow this road until you see festival signs! 10:30 a.m. to 4 p.m. Listen to an inspiring sermon! Wow! RASP’s 2013 Anthology of Poetry will be published and available. To celebrate, we’re having a special reading — anthology contributors sharing their words and work. We’ll also have the open mic, so plan ahead. And we’ll have a potluck party with all the trimmings, so bring your favorite snack, cake, cookies, what-nots. Join us as RASP enjoys this landmark in our long history of activism in Redmond. Look for us upstairs in Room 206! RASP events and readings are held upstairs in Room 206. There is an elevator near the checkin desk in the mail lobby. On the second floor, turn East (right from the elevator, left from the stairs) through two sets of doors and veer right to the first room on the right. LiTFUSE Poets’ Workshop, Sept 27-29, Tieton, featuring Dorianne Laux, Jennifer Sweeney, Christopher Howell, Lauren Zuniga, Andre Feriante & MORE. Only $160 till 8.16, then just $170 – including the Saturday Poets’ Banquet! Announcing SEVEN LiTFUSE scholarships: 4 for younger poets (under 35) & 3 for poets in need. Apply to michael [at] litfuse [dot] us, stating your age (if applicable), your need (if applicable), why LiTFUSE will make a difference to you, and please send up to 3 pages of poetry.